Hello, everyone, Marina Sofia here tending the bar, and at this time of year I know that most of us are thinking about holiday getaways and plenty of rest. So I have a very simple question for you today: Where do you like to go to feel really on ‘holiday’? Tokyo has always had a calming effect on me, despite its frenetic pace. Perhaps because when you turn a corner, just off a really busy main road, you can find a forgotten little miniature shrine or an old house with paper walls, where time seems to have stood still. Most often it is to the stream to speak with the water, and perhaps sing to it – as it does me. Also, time among the homeless and destitute – keeps you humble – & they have some pretty amazing stories as well. I think it can be anywhere really – a busy streat even, or a subway bench. Wherever you remember to breathe. It is a dance you learn the steps to. Observation, inspiration with no expectation. Yes. INteraction, conversation, community…I am no better than them and I leach nothing from them. I know many of their names as I have taken “time” to be with them, and hear them. Well, I always feel as if I am on holiday when kids are off school. This comes from many years of being a teacher & now being able to enjoy this time with grandchildren as well. Summer vacation to me translates as being off school! Yes, I really think they do, bless them! Also, there is still a lot of admin and lesson preparation going on even in the holidays. Oh, yes, most certainly away from work, couldn’t agree more! I find it amazing though, how many people check their emails or phone messages even when they are on holiday. Do they think (or perhaps they really are?) themselves that indispensable? I used to do that until my husband hid my laptop and phone when we took time off. I did it once and not again. Amended my messages that I was gone and to contact someone else! Talk about burn out waiting to happen! That is nice. Unfortunately, I used to back to piles, 100s of emails, etc. I was happy to retire! There are some jobs which mean you can never be out of contact but for most of us, leaving laptops at home is a wise choice. You are so right, Claudia – sometimes the big annual holidays, with all the planning that goes into them, the anticipation, the expenses, the travelling… end up being just a tad disappointing! Our neighbours have a fabulous garden with a pool, a sofa, a place to eat… and they seem to have permanent holidays in there. No need to go elsewhere! That’s the spirit! Bike rides to work …sounds wonderful, claudia. A calming way to begin the day. Ha! I take my holidays in the fall and winter – in the Summer, it is too hot and crowded. I often go in January to the beach – often alone on the beach. Or the mountains in the fall. My husband and I enjoy going where we can be quiet, renew with each other, not be stressed. One of our best vacations was a “stay-cation” a couple of years ago. We went to the local museum of fine arts, Poe museum, some local historic sites and ate at restaurants in different parts of the city from where we normally go. No stress of preparation, no time spent travelling – sleeping late, staying up late. but anytime I can retreat by the water – stream, lake, ocean – or to a Japanese garden, I’m happy. My #1 favorite place to be calm and at peace is Ryoan-ji and in the Kenrouken gardens. Japan isn’t always available – grin – but have been enough times I can be still and visit in my mind. So wise, Toni! Staycations can be wonderful opportunities to explore the local area. We had a week of pool-hopping two years ago with my boys: they had swimming lessons each morning and then we would spend the rest of the day at one of the many outdoor pools in the area: one in the lake, one with pools with slides, one on a grassy beach, one on a sandy beach etc. etc. It was lovely – except that last year the weather was miserable, so we couldn’t repeat the experience. It was great! There was a special exhibit of a photographer who specialized in full body Japanese tattoos – so colorful. The Poe museum we had always wanted to visit and never found the time and we hit some historical sites. Richmond has many. All the different restaurants we had wanted to try – both of us are uber foodies. And we went to an amusement park, about 30 minutes north and rode scary rollercoasters and screamed and screamed. We didn’t take phone calls and acted as if we were truly out of town and away. There is also a wonderful botanical garden in town, given in trust to the people of Richmond. One of the larger sections is a Japanese garden with water features designed in 1910 by two special Japanese designers brought over for it and in another section, a beautiful small park designed by Gilette. It was wonderful to take the time to look and enjoy and not be rushed. In the middle of the week, we were virtually alone and the restaurants weren’t crowded. We are doing staycation again this year. my husband’s health doesn’t allow for too many vigourous activities so we will do the museums again – this time Warhol and Monet in special exhibits. Cities while fun to visit, tire me. The people seem to take my energy somehow. I prefer the mountains, horses or a bicycle to recharge. I like the mountains and the ocean….but in fall and winter! We avoid the crowds. Sometimes in January, I go to the beach by myself for a few days. Watching and walking in the snow by the ocean waves is very different and so silent. Peaceful. Or sitting by myself on a dune playing my violin to the sound of the ocean…oh my! music and the sea – sounds great – and very refreshing…. And br-r-r-r! But it is peaceful. My husband holes up in the room reading. Very quiet it is. You are right, cities can be so energy-zapping! I think I’m more nostalgic about cities now that I no longer live there. When I was commuting every day in London, I started hating the city and could only see the drab and grey there, nothing of beauty whatsoever. I would love to see the redwoods on the left coast. Definitely on my bucket list as well, X.
I’ve been among the redwoods…one of my favorite vacations. Being away from home means fewer chores and meals to think of so it allows me to really feel on vacation. But only if you don’t rent a cottage/villa and end up cooking even more than you do at home, because the family is there for all meal-times and starving all the time… I’ve had holidays like that and then breathed a huge sigh of relief when we got back home! I find that I enjoy the freedom of the actual travel even more than the destination….no matter where I go….I love the drive, singing to the radio and daydreaming along the way. It means so much to me to get a break from work and leave town. i love exploring anywhere that is new, but will always pass on the big cities. I don’t think I have enough inner peace to block out the noise. Canyon hikes, forest trails, admiring the infinity of the Great Lakes…even my backyard where chipmunks and squirrels entertain me…these are my favourite places for relaxing. Agree. There is just something about the open road; seeing all the sights, and new places. I do love my cities though. Ah, yes, that moment of ‘driving away’ or ‘setting out’, that sea of possibilities… I know just what you mean. Not knowing where your car will take you. Although I do love exploring big cities too and getting lost in them. I know this sounds evil, but the only time I feel any sort of peace is when the rest of my family leaves the house for the day, or even overnight. I don’t need to go anywhere to relax; I just need everyone else to leave so that I can be completely consumed by a rainbow of strange thoughts and hipster catacomb music. and allowing me to watch Game of Thrones on the Big TV upstairs and not have to go to the basement. Lol. I guess I’m going to have to stop changing names so that my comments can be published. I hate keeping the same name for more than a couple of days in a row, though. It just feels so wrong. 😛 I used to do this as a kid, too. I remember going for like a week talking in an English accent. I thought my mom was going to kill me. Hee hee. 🙂 I should have been an actress. I got offered the part of Antigone once, but I was too shy to be on stage. I should have done it; maybe my life would have turned out differently. I love Game of Thrones, but we have to watch it on the tablet … which I hate. I have to be able to move around. I’m too jittery to sit still. Homeland is the only one I will allow myself to be addicted to at the moment. I know, right? They have to go away for me to appreciate them. 😛 When they come home, I can be nice again. I’m just one of those people who would way rather go to a restaurant, movie theater, etc. alone. My friends thought I was crazy (pre-marriage) because I preferred to go places alone. That’s just me, man. A born loner. So living with a houseful of people drives me insane! “catacomb music” … I just made that up. I guess it’s to help you envision what music does to me when it oozes into my deepest places, places no people can get to. It’s just my dark corners, my id, and my music. I say pre-marriage (and thereby pre-kids) because post-both, life doesn’t allow me friendships. I have to say that the most relaxing has to be weatherlocked in a remote cabin. We have actually started to plan our trips so that happens. There is nothing more relaxing than to be reading a book while the snowstorm is howling outside..
…by a fireplace? We love sitting by a fire outdoors too. Camp fires! Oh, yes, some of my best moments in life have been spent around camp fires! It does sound wonderfully cosy – but perhaps only for a day or so. After that, it might get a little claustrophobic. Cosy and with nothing to do but read. Sounds perfect. And I think this is another reason I love the snow so much. Rarely houselocked here, but snow on the roads removal is a slow process and being out in the country as we are, it can take a couple of days – traffic almost ceases, businesses close or change their schedules…quiet all around. The fireplace going, reading…like an impromptu holiday without all the hysteria. Hokusai (1760 – 1849) was a Japanese painter — the great wave and many more. He went by >30 names in his life to mark periods of his life. He kept changing. I think many of us here, at dVerse, finds vibrant life in everything around us when we stop and look. Meaning fills everything. Here is a fun YouTube reading of Robert Keyes’ poem. Like Wordsworth, even Hokusai saw resonating meaning even in the busy city. 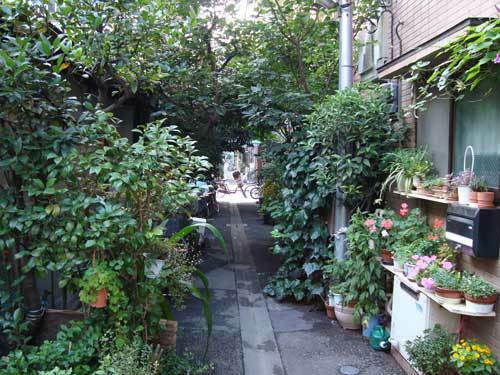 Marina — I agree about the hidden rich places even in the bustling cities of Japan — as if they nurture it. I find peace with my music, my showers, my conversations and my walks. And, when I remember, with occasional stops to find rich meaning in the more mundane. Thank you for that link – lovely addition to the poem about Hokusai. Do you know, I’ve never thought of showers as restful places – perhaps because I always take them in a hurry, thinking of the next thing I’m about to do. Talk about lack of mindfulness! Ah.. humans.. such sad animals are many of they..
feel a life.. fill a soul.. with heart..
but truly to make the darkest events of life sacred..
and i will float in bliss. It”s nice to escape Holidays..
at least for me.. smiles.. I like the idea of many little moments of ‘holinows or holynows’, instead of ‘holidays’. It does feel that when you have those long-planned vacations, you put too much pressure on yourself to ‘enjoy them or bust’. And sometimes you just don’t… and miss the opportunity for many other relaxing moments along the way. As for Marina – it’s a name I chose rather than one that was given to me – mind you, it would have been the name I’d have given to my daughter, if I’d had one. making you forget who are//change the way you write//the way you be U. Ya, log out – before you take yourself too serious. Ah, wise man – there are quite a few people I could mention who don’t seem to have learnt this. And spend most of their holiday (day off, lunch with the family etc.) checking for phone signal and complaining about the lack of it. I’m not able to afford actual, pack and go somewhere, vacations–but that doesn’t bother me, as I was gifted with a non-stop, flights-of-fancy imagination. So essentially, I live at the Beach (mentally) All the time, Everyday! Never bored, lots of treasures and romance–very content and happy camper!! My husband and I do staycations! Lots of fun things to do in town and because in the middle of the week, no crowds. There are plenty of free and el cheapo things to do in town and we enjoy them. That is such a good idea–great for you! That is a wonderful way to be! I sometimes think faraway places and expensive vacations are wasted on people who don’t quite know how to appreciate them, who look at everything only through their phones or cameras so that they can then post them on FB and boast (nobody shows holiday snaps to friends anymore, do they, but I remember a time when I was subjected to long evenings of these…). But they haven’t actually stopped to absorb a place through every pore. I think you’re on to something there, Marina Sofia! And don’t forget–in addition to the old snapshot show and tell, there used to be “home movies of our vaca”!! I’m probably telling my age! Or who can’t live the moment or enjoy it because they are too busy posting updates on social media. It’s like it isn’t real unless it is posted for the world to see. I’m too private for that. Another reason we travel off season – not only cheaper, but waaaay less people to get in the way. We are happy to know that on our staycation this year, there is a wonderful showing of black and white photography at the art museum and a new exhibit: cabinet of curiosities at the Poe Museum. And three new restaurants opened! So….. I could use a vacation..it has been awhile and work is swallowing me up. I enjoy water as I find it helps me find my rhythm and a mountaintop helps me find perspective. Sometimes, I just find a quiet place and drum and drift wherever the beat takes me. Water and mountains are indeed the best, so inspiring, so relaxing! I am very blessed to have both close to the hand and have to admit that on a sunny day after a bout of cold or rain, when you can see Mont Blanc and all the Alps gleaming above the lake, I shiver a little and thrill with the joy of it all! I hope to never become jaded about that. And hope you get a chance soon to have a proper vacation! In the southern hemisphere it is Winter and not a traditional holiday season. Because we are based in Africa, when we get leave we go home to see family and catch up with jobs at the farm and so we have not had a holiday in any real sense for many years. We have ‘tagged’ bits of holidays onto the end of work trips but that is not the same. My best holiday would be spending weeks travelling around the UK and Europe, soaking up the history which makes Europe so exceptional. My best holiday is immersing myself in history and good food and nothing beats the UK or Europe for that. I do hope your dream of a European holiday tour comes true some day. And apologies for being so Northern-hemisphere-centric. You do get some time off this time of year too, don’t you? For instance, many people in Europe prefer to take their trips to ‘hot desinations’ in winter, just to get away from all the gloom. Of course, for us, South Africa seems like such a wonderful holiday destination. Or Kenya. I still dream of spending several weeks in Africa, instead of, as you say, just tagging a few days off at the end of a business trip. Thanks Marina. I have lived in Europe and London a few times and spent months in Portugal and Russia so I have seen a bit but not enough. I cannot get enough of the history and where the food is good, the food. … France and Belgium. We lived in Antwerp for a few years. We get six weeks annual leave in Australia and yes, can take holidays any time. But more people do take holidays at home in Summer, because of the weather. If you are going overseas it does not matter and many Australians do, travelling more, per capita than I think anyone else. We have done a lot of our travelling in Europe and the UK and Ireland in Winter because you avoid the tourists. Having lived in both Johannesburg and Cape Town, sure, the latter is a great destination if you want some sun although crime there is now as bad as Johannesburg, but SA is deteriorating all the time and now, with power cuts regularly and the crime worsening and internet and mobile phone connections even worse, it is not such a great destination. We are however doing a safari later this year with family – our first real holiday in years – and that is always worth doing and had thought of spending a week in Cape Town but the cost of renting a house and the risk of being without power for a week made us change our plans. We are going to Victoria Falls instead, to a lodge where they will have generator backup. I have not been to Kenya but they have had a few bombings in recent times and so if you want to spend time in Africa I would say Namibia, Botswana or the Eastern Cape. And I would do it sooner not later. Sadly all of Africa is on a downward spiral and South Africa faster than most.